Bucket #1 has a closed bottom with a honey gate installed. Bucket #2 has an open top and a mesh or sieve bottom. Inside Bucket #2 is a fine mesh bag with edges secured around the end of the bucket with say, a giant rubberband or tape. Resting inside the mesh bag and on the edges of the bucket is a colander. Check the trusty diagram if you’re lost now. Bucket #3 has an open top and a closed bottom with a honey gate installed. 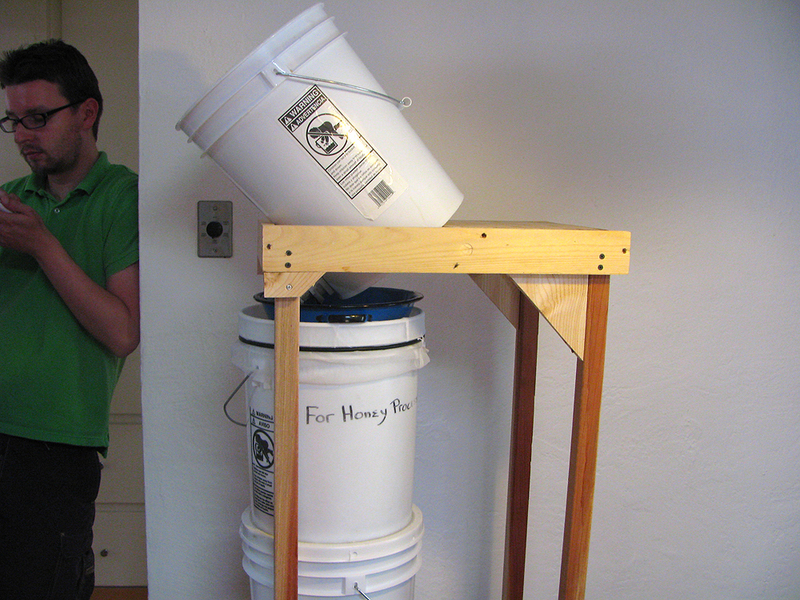 Build a wooden stand where the top has an opening cut for Bucket #1 to rest tilted forward. Or… just put Bucket #1 on a bookshelf or table where it might easily drain into Buckets #2 and #3. 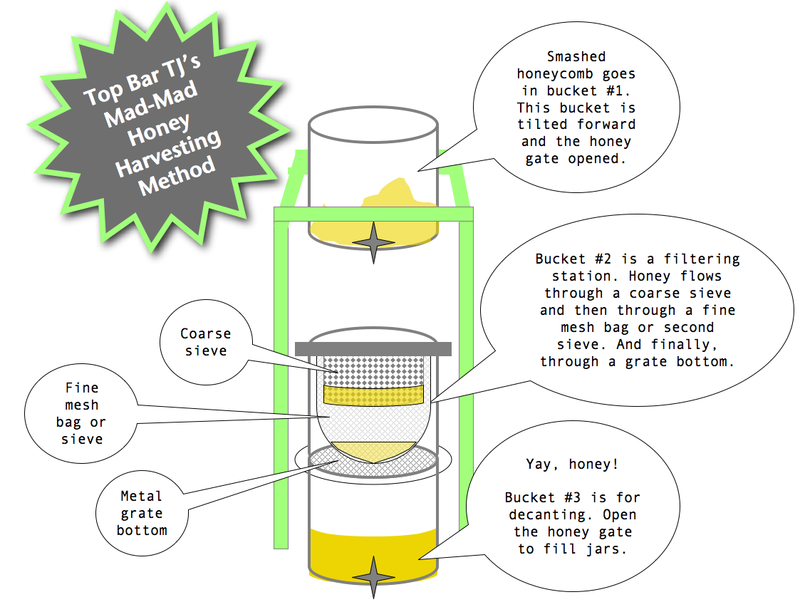 Then, set everything up as shown in the honey harvesting diagram. Cut comb off top bars. Place in Bucket #1. Chop, slice, or otherwise pulverize the honey comb in Bucket #1. I like to use a pastry cutter. Place TJ’s groovy honey stand on a bench or chair. Place Bucket #1 in TJ’s groovy honey stand. Tilt 45 degrees. Place Bucket #3 on the bench or chair below the honey stand. Place Bucket #2 on top of Bucket #3. So now you should have the buckets arranged in order from top to bottom where Bucket #1 is on top, in the wooden stand. Check the trusty diagram if you need to. Ok now, it’s business time! Check to ensure that the honey gate on Bucket #3 is closed. Check that the mesh bag and sieve on Bucket #2 are secure. 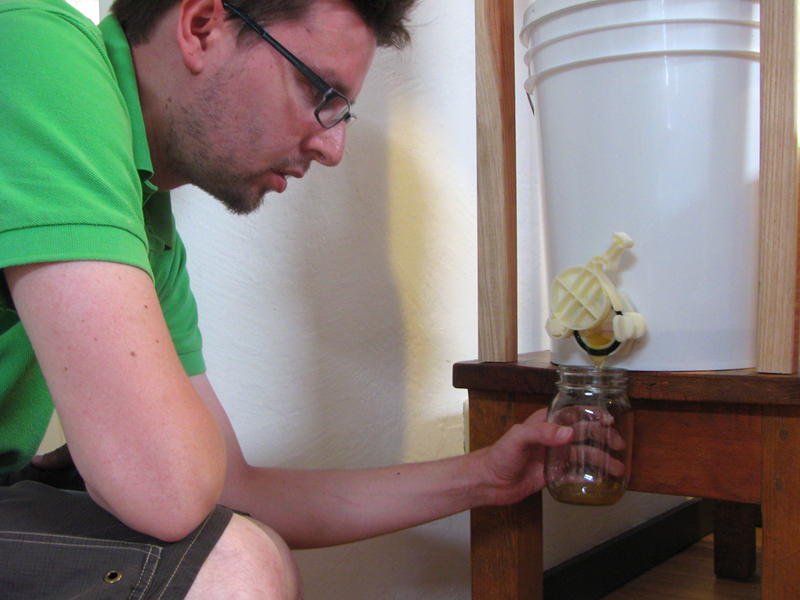 Then, open the honey gate on Bucket #1 and let ‘er flow. Wait 24 hours and decant from Bucket #3. Share with friends, neighbors, and lover(s).